Fire up the grill for this garlic stuffed ribeye recipe. 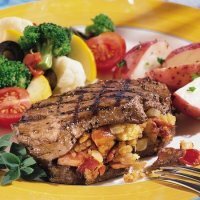 Topped with the sharp taste of blue cheese and stuffed with the full flavor of garlic, this hearty meal is sure to please all beef lovers. While you got the grill all warmed up, add some carrots or your favorite veggies for some additional grilled deliciousness. Compliment this meal with a nice crisp tossed salad with a low fat blue cheese dressing. This is not a light dinner, so be sure to save up some of your Weight Watchers Points for this meal. This steak lover's recipe has the bold taste of blue cheese and garlic, a touch of spice with the cayenne pepper combined with the tenderness of a ribeye. Place butter and blue cheese in a small mixing bowl. Allow blue cheese and butter to come to room temperature and soften. Add 1/2 teaspoon each of salt, pepper and cayenne pepper to blue cheese and butter and mix together to blend. With a sharp pointed knife, make a horizontal slit into one side of each steak. Stuff slivers of garlic into the slits. Season with 1/2 teaspoon each of the salt, pepper and cayenne pepper. Place steaks on grill about 4 to 5 inches from heat. Grill 5 to 7 minutes per side. Remove steaks from the grill and top with the cheese butter. Return steaks to grill and cook for a few minutes. 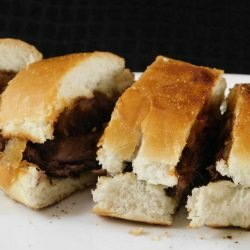 All ingredients were used with calculating Weight Watchers Points for the garlic stuffed ribeye recipe. For a cheese that is less sharp in flavor, try using goat cheese instead. 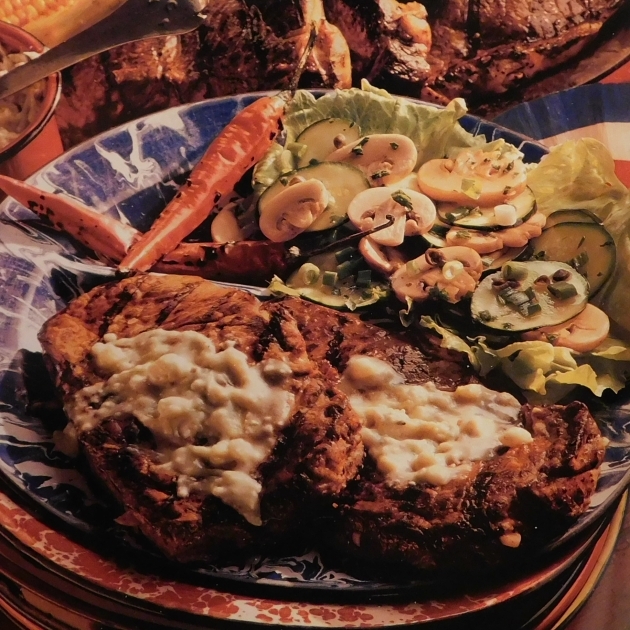 Here's a recipe for a Low Fat Blue Cheese Dressing you can use for a salad dressing to compliment this steak dinner. 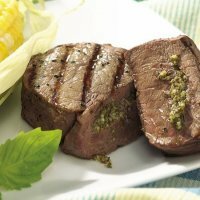 Fire up the grill and stuff yourself with this flavorful stuffed beef tenderloin. 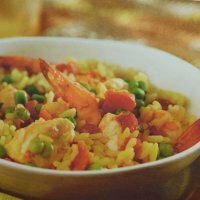 With only one Weight Watchers point, this Paella recipe is a tasty Spanish dish you will love. 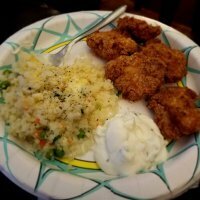 Serve these chicken nuggets with a healthy side and your favorite low carb dipping sauce. 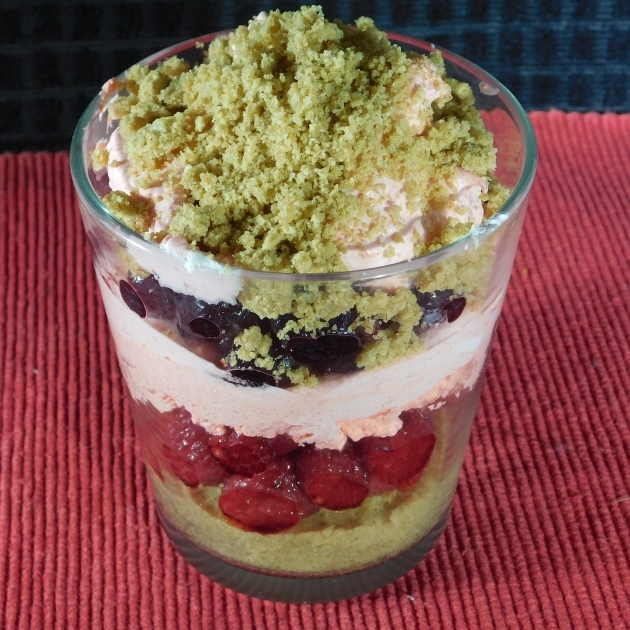 You can use fresh or frozen fruit for this dessert so you can make it any time of the year. Learn more about the various food groups and how much you should be having from each one in order to make a healthy plate. Don't be fooled by these myths. Learn what's fact or fiction when it comes to exercising.